In heritage cities close to big metropolitan areas as Toledo, declared Unesco World Heritage, High Speed Rail has become the favourite access mode for singleday tourists visiting the city. The access from the station to the historic centre becomes a relevant subject to study, as tourists can choose between different transport modes: walking, buses, tourist buses and taxi. Walking should be encouraged because it is more sustainable and tourists’ experience starts just in the rail station. In the case of Toledo, two pedestrian itineraries have been assessed, considering the quality of public space, the wide of footpaths, the continuity, etc. 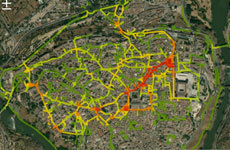 In addition, the use of these itineraries for reaching the city centre and tourists’ behaviour when walking around the historic city have been also analysed using GPS tracks shared in social networks such as Wikiloc. This is a powerful tool to understand the points of interests of the city, the density of use of the different streets and the use of different access to the walled city.